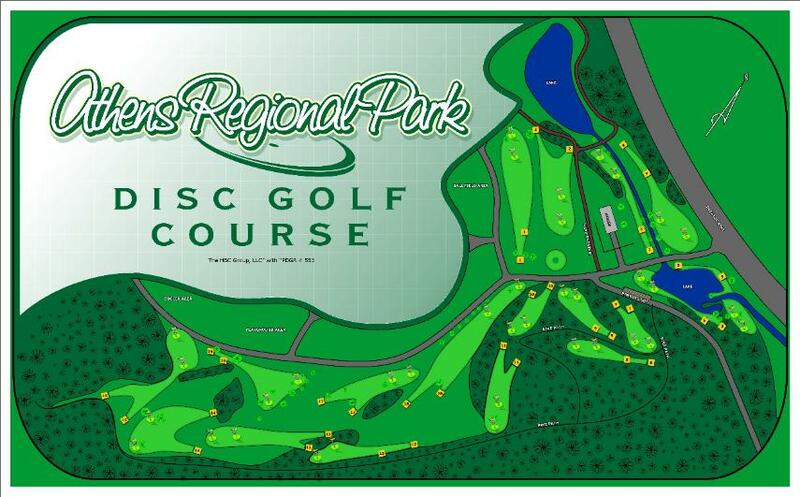 Decatur Pike and Regional Park Dr.
Professionally designed course. Dual tees (short and long) and dual baskets (18 red and 18 yellow), so the course can play as 72 different holes. A good mix of open, wooded, hilly, and even some water hazard holes too. Good concrete tees and tee signs, and the course is just one mile from I-75. I-75; Exit 49. Go east 0.7 miles to the park on right. Parking for disc golf at 1st parking lot in park. Blue practice basket by road. 1st tees are uphill by small shade trees. Everything about this course is very nice accept its only a 9 hole. The site says 18 but they include the pro chains as well. New large pads and hole descriptions at every hole. It can get a little confusing finding your way around the first time you play. There are a few holes with water making it pretty challenging and pretty easy to lose a disc. All in all a very fun and well maintained course...just needs 9 more holes.